Class 6 sample paper & practice questions for ASSET Math are given below. Syllabus for level 1 is also mentioned for these exams. You can refer these sample paper & quiz for preparing for the exam. 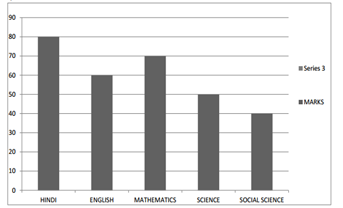 The following bar graph shows the marks obtained by Ramesh in different subjects in the Session Ending Examination-2012. Which of the following is the difference between the maximum & the minimum marks? How many prime factors do 1256 has? Express 97/24 as improper fraction. The perimeter of regular octagon is 16 cm, the length of each side will be? A cricketer scores the following runs in eight innings: 58 , 76 , 40 , 35 , 46 , 45 , 0 , 100. What will be his mean score? A man travels 240 km by bike and 460 km by car. Find the ratio of the distance he travelled in bike and car. The following bar graph shows the marks obtained by Ramesh in different subjects in the Session Ending Examination-2012. In which of the following subjects Ramesh scored minimum marks? The following bar graph shows the marks obtained by Ramesh in different subjects in the Session Ending Examination-2012. What is the total marks obtained in all the five subjects?